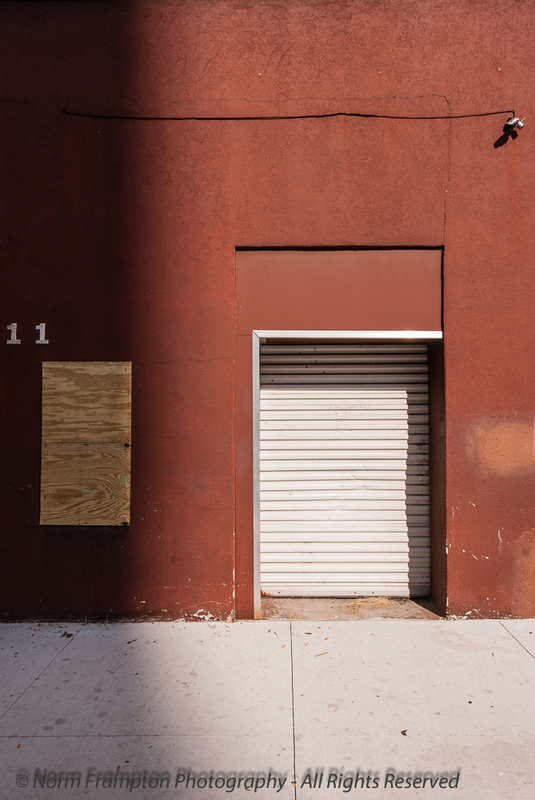 A few weeks back I featured my photo walk/doorscursion with Michelle Lunato during my time in Atlanta in this #ThursdayDoors post. 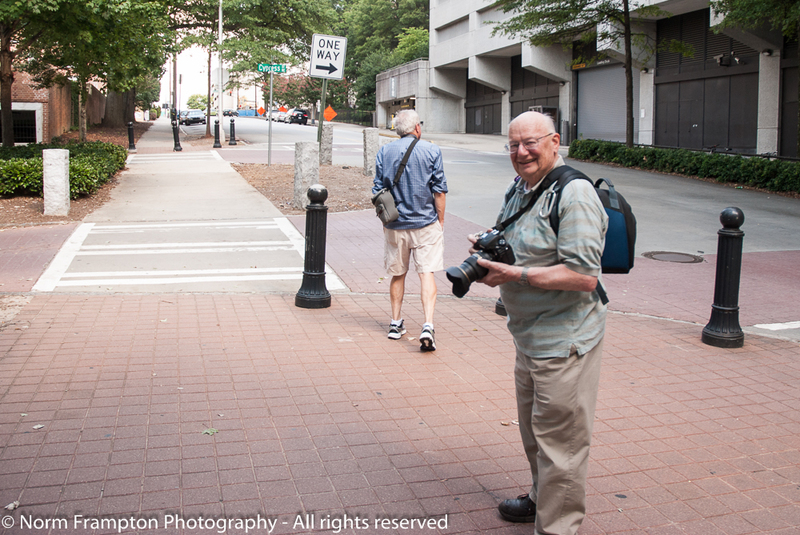 I was also lucky enough to meet up with another Atlanta area blogger, Ludwig Keck from Two Camera – Two Views. Ludwig and his friend David were nice enough to come in to town to join me for a doorscursion around the Midtown area; a part of the city which I had never seen before. For those who have never been, I’d say that it’s relatively easy to keep your bearings straight in Atlanta…ahem, once you get used to the fact that every other street is called ‘Peachtree’ Road, or Lane, or Boulevard, or something. Then don’t forget to factor in the added confusion of all the possible cardinal point combinations and permutations i.e. 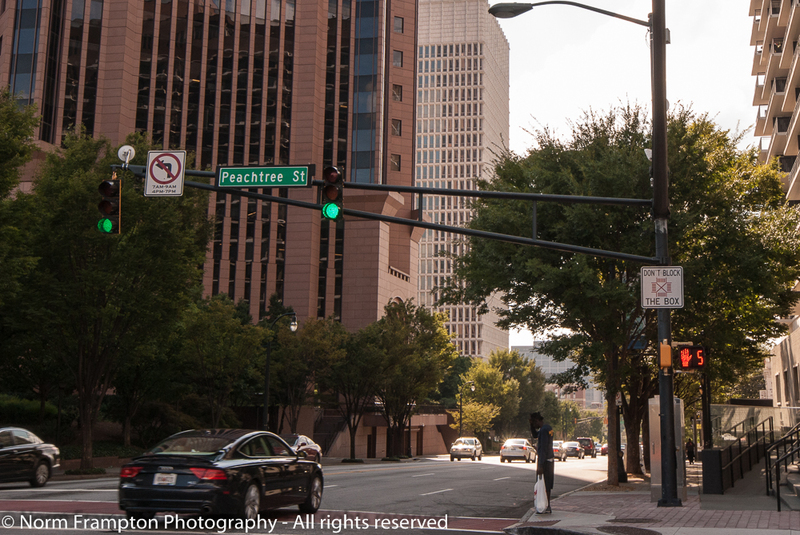 NE, SW… or the classic South Peachtree St. NW!?!? Really Atlanta? FFS! All the more reason to go exploring in the good company of locals. 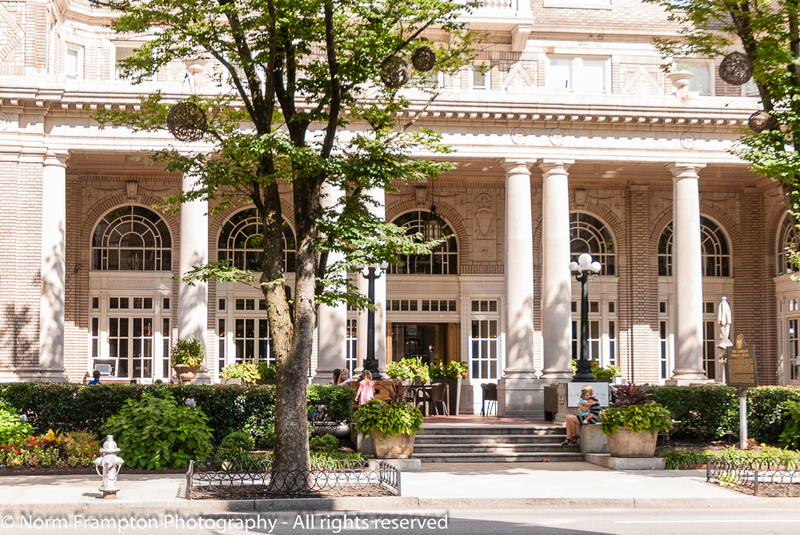 So the three of us met at my hotel and headed out on foot with cameras in hand. One of the first places we passed was this little restaurant with an iconic little mascot sitting out front. Anyone care to guess what type of food this place served? Would be a cool way to deliver pizza. 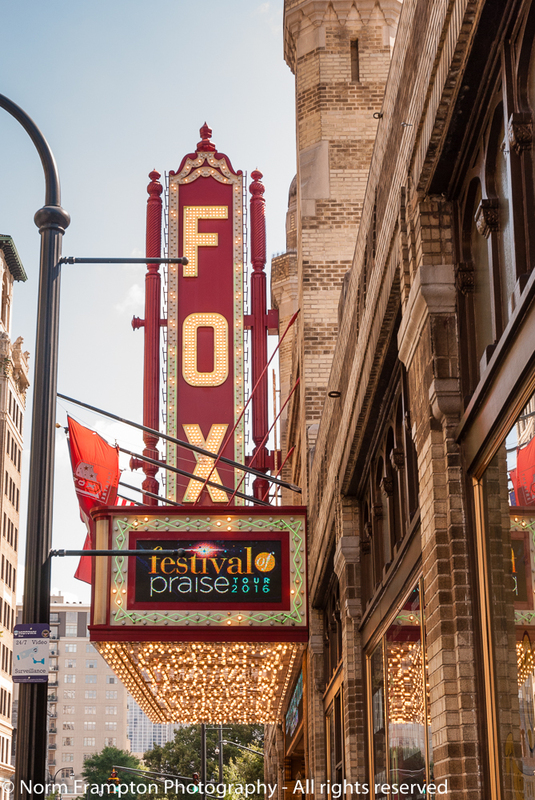 We walked a few blocks east and in no time we were in front of the historic Fox theater. I’ll have another doors post totally on the Fox in a week or two but for now check out the wonderful old sign and marquee. I had no idea that the Bard hung out in Atlanta – surely thou jesteth…y’all! These last shots are all from Saint Mark Methodist Church with great hardware and stained glass. I would have loved to see the inside of this place. Many thanks again to Ludwig and David for an enjoyable afternoon as well as the chance to get out and discover some of the city. Special Note: Monday Oct 10th is our Thanksgiving holiday here in Canada so as I do each year, on Friday evening I’ll be unplugging completely from all social media to enjoy the long weekend with family and friends. I’ll be back on Tuesday to reply to comments and check out any Doors posts I might have missed. Gallery | This entry was posted in Photography, Thursday Doors and tagged all Peachtree all the time, Atlanta, Doors, Doorscursion, Georgia, Thursday Doors, USA. Bookmark the permalink. Love the red doors on the church! They are so bright – quite the unexpected view. Oh my! 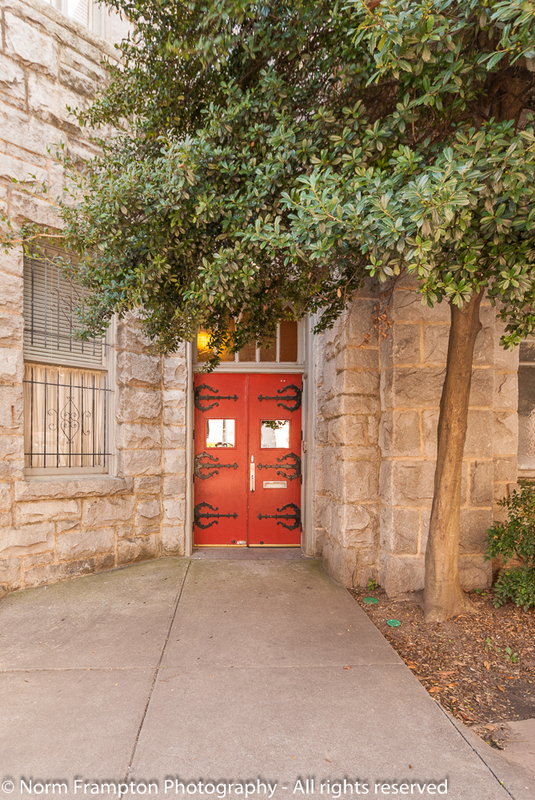 Those lovely red doors with all that gorgeous ironwork – and so many of them. I had to laugh at the ‘no sagging pants’ sign, first time I’ve seen one of those. As for that sweet little car, it looks like a Fiat Bambino. My mum had one of those for years and loved it. Thanks Jean. 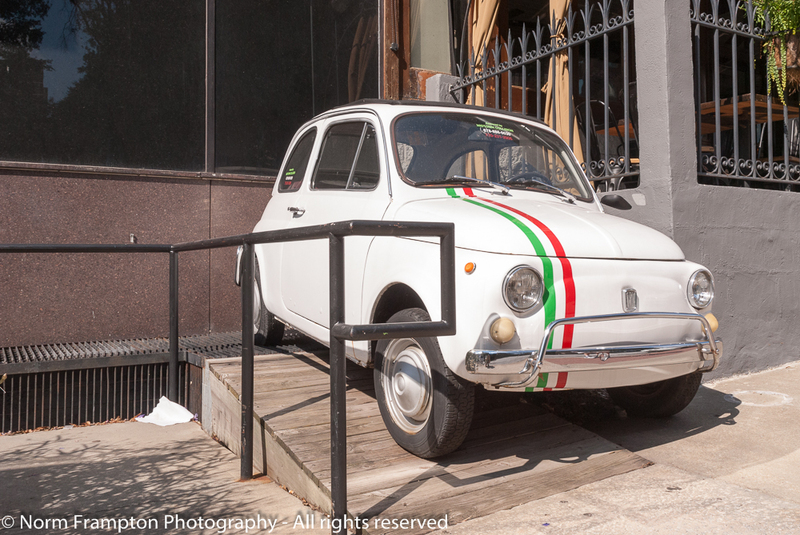 The new version of that Fiat – 500 I believe it’s called – is all the rage here these days. Folks around here like these fun little cars that are good on fuel. great doors – but the window selfie stole the show for today’s post – the no sagging pants and of course the way you are right behind the words – just a sweet shot. and side note – hope you don’t mind me saying this – but the watermark image of your name – the shadow effect seems to pull from some photos – if you really like it then I would say keep it – but I think that a cleaner logo would be more subtle and not pull from some photos – hope it was okay to mention that – but no reply needed. Hope you enjoy your Thanksgiving dinner and family gatherings, Norm. The Marquee is great, and those Red doors at St. Marks are wonderful, finding the Shakespeare theater was interesting. It reminds me of the Globe. It looks and sounds like you 3 had a great Meet-Up! Thanks Deborah. Yes we had a lot of fun. Love those doors and architecture. I’ve driven I-75 many times through Atlanta…even in rush hour. That was enough for me, but there seem to be some beautiful buildings as I’ve looked about the cityscape. 🙂 Great finds. Thanks. This was a terrific opportunity to see something other than the hotel, airport, and the convention center; a pleasant change from the typical business trip. Wishing you a great time – greatly concur at family time to cut off social media! Love sign about the sagging pants:) The doors are gorgeous as always! Oh, you did well, Norm. I’m jealous! Great photos, even though one is spoiled by that old guy with the camera. Ooh, all those red church doors! Thanks Joey – it is nice to totally unplug once in a while. Great shots, Norm. Loved the ones of the churches. I so wish I had taken pictures of the churches I went to when I was in Palma de Mallorca a few years ago. It also makes me so sad that churches are no longer open all the time. I remember, as a child, going into the cathedral and a couple of other churches/chapels in the little town where I grew up. We had nothing better to do, but it did give us an appreciation of the art and architecture. Be well! A ” No sagging pants” sign- that’s a first ! 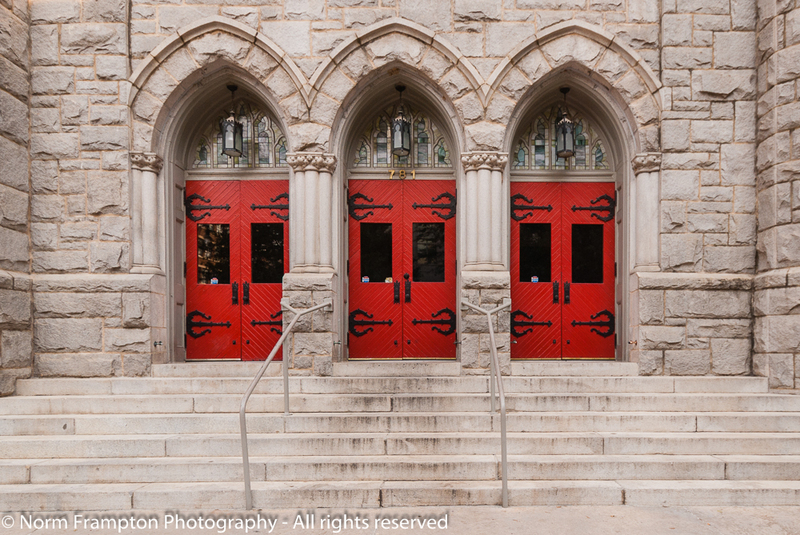 Love those bold red church doors with those larger than life black hinges…so bold and striking! The Georgian windows are pretty gorgeous too. Lovely to see some Atlanta doors and all you guys out there busy snapping doors and windows…Fun! Hope you enjoy Thanksgiving Norm.Eat and be merry. Nice doors particularly liked the red ones! 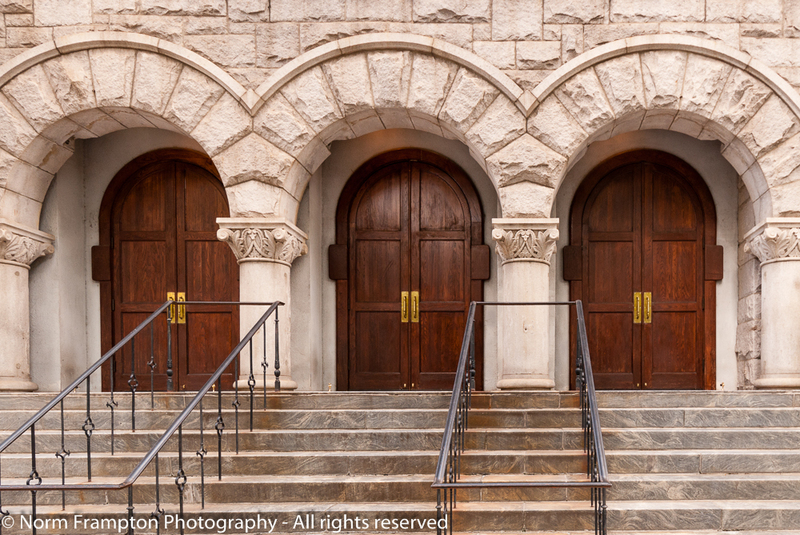 Those St Mark Methodist doors are lovely. Nice doors, Norm. The red doors of the church are my favorite. 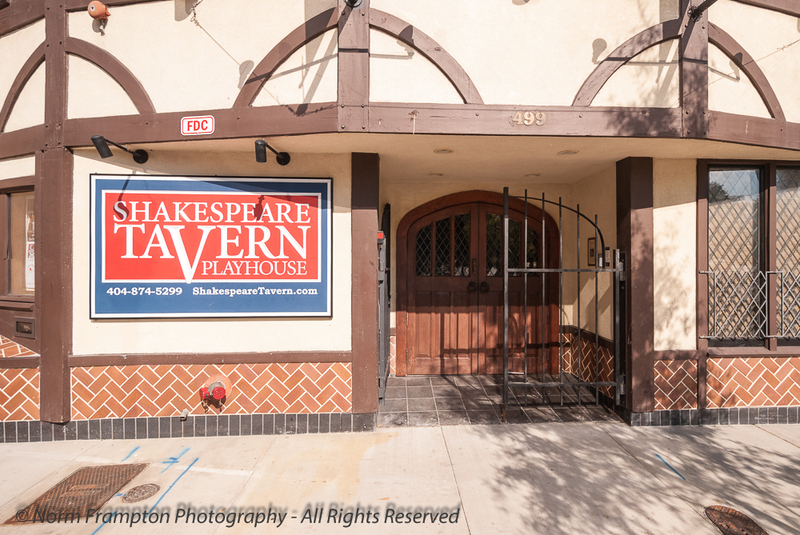 I love Shakespeare Tavern! Been a few times, so much fun! At the hour we passed in front of it I’m not sure it was open yet, but it did look like a fun place. Yes the tavern did have something of an octagonal shape to it. Happy Thanksgiving a bit early. Really? A sign for No Sagging Pants?!! That one’s a first for me. 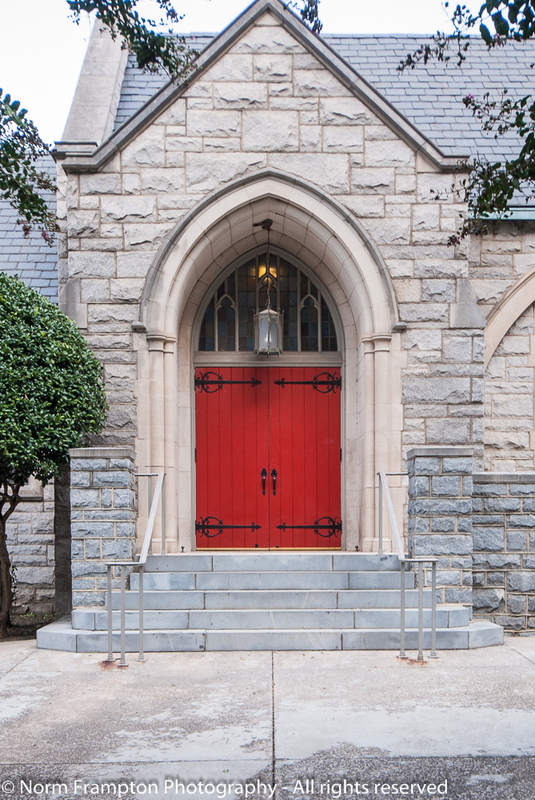 I too really like the red doors for Saint Mark Church. That style of hardware always reminds me of Neptune’s forked staff – except reversed. Another fine collection of doors, Norm. I’m partial to the red doors at St Mark’s. Those hinges are amazing and I love the side door. Arched doors, set into stone entrances are just so impressive. I would love to see what it behind sll of them. I only.walked around Atlanta once, back in the early ’70s. Since then, it’s just been the airport for me. Thanks again for hosting Thursday Doors, Norm. I really enjoy reading these posts, and sharing interesting doors. Thanks Dan, especially for all your support. This visit was the first time I was really able to get out and explore a little. It’s usually airport, hotel, convention center and then home, so this was a pleasant change. Thanks Judy. My guess is this place has had trouble in the past. The sign on the other window was a reminder for patrons to leave their weapons in their vehicle. Yeah to the cinquecento, sagging pants which happen if we want it or not, the lovely red door finish, and my favourite, demure no. 11.